The collection of Ceske Loznice magazines is submitted to your attention. Club - the legendary magazine which is the homeland of the hottest sexual superstars in the world more than 30 years, and still establishes norms of qualitative content. Here you will find the most sexual babies in the world – today's legends and tomorrow's pornostars, high-quality photos, exclusive interviews and many other things. The collection of Erotik Highlights magazines is submitted to your attention. The collection of Gin Fizz magazines is submitted to your attention. 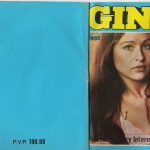 The collection of Gina magazines is submitted to your attention. The collection of a photo of Girls from the 60's - 80's is submitted to your attention. The collection of Girls magazines is submitted to your attention. The collection of Guts magazines is submitted to your attention. The magazine for people who dare. The collection of Hawk magazines is submitted to your attention.